Happy Tea For Two-sday to all of you! Hope you are having a wonderful week so far. Recently, DaySpring was kind enough to send me some tea things to review. They are so pretty! I will be talking about them over the next few Tuesdays. 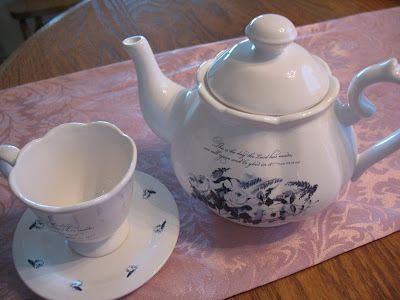 The first is this very pretty teapot and teacup. The white color and the delicate writing give them a fresh and feminine look. 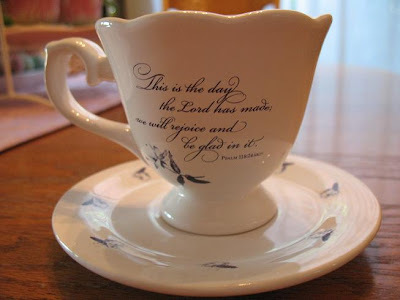 What an inspiring way to start your day - tea in a pot and cup with scripture. The best part is that they are not only pretty, but functional too. They are sturdy and the cup is even microwave and dishwasher safe. Sounds like they know what moms need! Also, they are available for purchase separately. You can enjoy some pretty tea things from DaySpring too and get 20% off your entire purchase by using the code "SPRING09" (Good through May 1)! Be sure to come back next Tea For Twosday - I'll have something pretty from DaySpring AND I'll be giving it away!! I'm linking this up at Time For Tea hosted by Tea and Thee - go enjoy some more tea posts! Oh that's very pretty. Do you get to keep it? I wanna "test" things! LOL. How are things in Montana? Have you found a restaurant with toilet seat covers in there restrooms and that serve soup on Sunday? LOL. Big I wore my apron that I won yesterday but forgot to take a picture but will get right on that and post it sometime this week size hugs to you my friend. 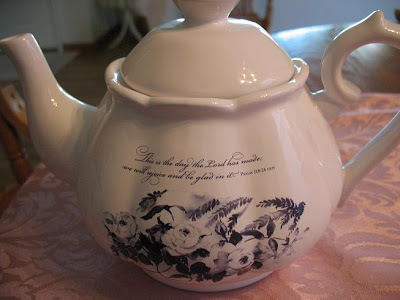 Oh that is so pretty...love it I could just see me drinking my coffee from it..
not to much of a tea drinker.. They are beautiful. What a great gift they would make for a tea Lover. I am going to have to get it together one week and play along with your Tea for Tuesday. I have lots of pretty tea things that I would love to share. Of course, most of them are antiques and I never use them. But they sure do look pretty on my shelves. Hope your enjoying your time in Montana! That teapot is just lovely! Oh, your blog is very very sweet, I loved !! Im from Brasil. I will always see this page. If you have a time go visit my blog! www.caemcasachocolat.blogspot.com Thanks Good Luck ! !